Standing Stones In North Carolina? 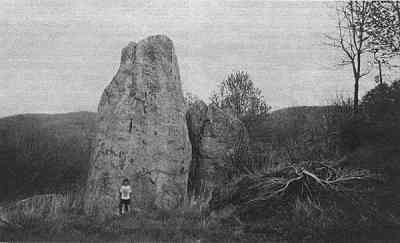 A North Carolina reader recently submitted the accompanying photograph of very large, vertically oriented stones that, if found in western Europe, would be quickly assigned to the megalithic culture. Although similar upright stones are known in New England, we have not heard of any in North Carolina before. The stones in question are located in the Boone/Blowing Rock region of western North Carolina near Foscoe, very close to Grandfather Mountain (second highest peak east of the Mississippi). Although they could well be a product of natural forces, they stand out like the proverbial "sore thumb." Row of three, large, erect stones in western North Carolina.